Posted on Thu, Feb 16, 2012 : 5:53 a.m. In "Ghost Rider: Spirit of Vengeance,” Nicolas Cage reprises his role as Johnny Blaze in this gritty new vision directed by the team of Mark Neveldine & Brian Taylor ("Crank"). "Ghost Rider: Spirit of Vengeance” opens Friday. From the mind of master animator Hayao Miyazaki and Studio Ghibli ("Spirited Away," & "Ponyo") comes "The Secret World of Arrietty.” This animated adventure, based on Mary Norton's acclaimed children's book series "The Borrowers,” opens Friday. In “This Means War,” Chris Pine and Tom Hardy play the world's deadliest CIA operatives who also just happen to be best friends—until they fall for the same woman (Reese Witherspoon). “This Means War” opens Friday. 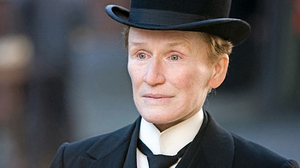 In “Albert Nobbs,” six-time Academy Award nominee (including a nomination for this film) Glenn Close stars as a woman forced to live as a man in 19th Century Ireland. Roger Ebert of the Chicago Sun-Times says, “This is such a brave performance by Glenn Close.” In addition to a Best Actress Nomination for Close, Janet McTeer also received a Best Actress in a Supporting Role nod, and the film also received a nomination for Make-Up. “Albert Nobbs” opens Friday at the State Theatre. Come sing along with Ariel, Sebastian, Ursula and the rest of the gang when the “Sing-Along Little Mermaid” comes to the Michigan Theater! “Under the Sea” and “Kiss the Girl” are just two of the great songs from the Oscar-winning score by Alan Menken and Howard Ashman. “Sing-Along Little Mermaid” plays Friday, Feb. 17 at 7:30 p.m.; Sunday, Feb. 19 at 1:30 p.m.; and Monday, Feb. 20 at 1:30 p.m., and each screening will feature a costume parade, goodie bags and prize giveaways! Specially priced tickets will be sold at the door. The Nam Center for Korean Studies concludes its "Cinematic City: Seoul" series with a special double feature of “The Housemaid,” featuring the seminal 1960 version of the film and a 2010 remake. “The Housemaid” double feature plays Saturday, Feb. 18 at 2 p.m. at the Michigan Theater; admission is free. UMS and the Michigan Theater join forces to bring a high-definition screening of live theater by the National Theatre, London to Ann Arbor! “Travelling Light” is a funny and fascinating tribute to the Eastern European immigrants who became major players in Hollywood’s golden age. It plays Sunday, Feb. 19 at 7 p.m. at the Michigan Theater. Tickets are available at ums.org. Martin Bandyke's Moving Pictures Film Series continues with a special double feature! Part one is the Georges Melies' historic touchstone film “A Trip to the Moon.” This original hand-colored film print is direct from its re-premiere at the Cannes Film Festival. Part two is “Joy Division,” the documentary film about the 1980s Manchester, England-based band that changed the face of modern music. “Joy Division” and “A Trip to the Moon” play Monday, Feb. 20 at 7 p.m. The Ann Arbor Film Festival’s year-long celebration of its 50-year history concludes with Robert Gardner's feature documentary “Forest of Bliss,” which played at the 24th Ann Arbor Film Festival in 1986. This landmark documentary was recently restored and is on loan from the Harvard Film Archive. The AAFF 50th: Retrospective Series plays Wednesday, Feb. 22 at 7:30 p.m. at the Michigan Theater. Thu, Feb 16, 2012 : 6:28 p.m. Saw a screening of This Means War with my nieces; we laughed so much that we were in tears for some parts of the movie! Loved it! Thu, Feb 16, 2012 : 5:54 p.m.
Nooo! I forgot to get Saturday off of work, and I'm going to miss the Housemaid double feature! I'll just have to console myself with Trip To The Moon and new Miyazaki. Thu, Feb 16, 2012 : 3:16 p.m. I can't wait to attend the Sing-A-Long The Little Mermaid screening Friday at 7:30! Thu, Feb 16, 2012 : 2:48 p.m.
Can't wait to see &quot;Albert Nobbs&quot;!! Glenn Close is amazing. It's always hard to choose which movie to see at the Michigan, but I'm hoping to see &quot;Albert Nobbs&quot; this time. Thanks, Michigan Theater, for offering so many fine art films and events. I saw a &quot;Coming Soon&quot; sign for &quot;Shame&quot; last time I was at the theater. Any news on when that will be playing? Otherwise, neat stuff coming up. &quot;A Trip to the Moon&quot; should be fun. Thu, Feb 16, 2012 : 12:41 p.m.
&quot;This Means War&quot; looks like a lot of fun. I'm looking forward to checking it out!